The following are the Pakua disciplines taught in general class featured on our schedule. A list of other specialized classes is featured on our front page. These classes and courses can be scheduled at your convenience. Most classes feature a FREE TRIAL but please call ahead to schedule your trial. Chinese Yoga, also known as Syntony, is one of the popular classes taught at Pakua Long Island. A Syntony class is akin to a spa session for body and soul in which the participant directs the intensity of the movements. In a relaxed and comfortable setting one performs stretches, poses and various forms of meditation, designed to stimulate physically and mentally. The ultimate goal is to work towards internal balance as well as harmony with the surroundings. Syntony movements, breathing techniques and meditative poses have long been used to alleviate various disorders. It also has a long track record for stress reduction. Be it a class once a week or every day, the practice of Syntony is sure to help you find your inner self and assist you in achieving mental balance. Classes available in the morning and in the evening. Archery, is taught in our school in the most ancient Chinese Martial form. Lost for generations, this art is experiencing an unprecedented revival thanks to the International Pakua School. 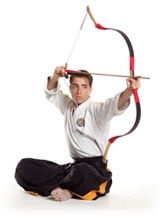 The bow and arrow enable the practitioner to reach targets further than with any other Martial weapon and thus expands the person's ability to reach greater goals when he or she steps off the mat. Integrating a full Martial curriculum, classes are both physically and mentally stimulating. They develop focus, precision and self discipline. Archery is available to all students above fourteen years old. The art is taught in a belt system with techniques building upon each other to form the student into a Master Archer. Pakua Archery includes meditation, physical and aerobic exercise as well as the great release produced by shooting arrows. Traditional Chinese Sword, is an ancient art that involves precision, discipline and mental power. 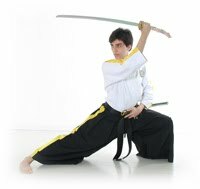 The student begins by training with the bamboo Shinai in order to become familiar with the positions, movements and techniques, quickly moving on to working with a sword and multitude of other cutting weapons. Classes are stimulating both physically and mentally, and help the student develop confidence, focus and the mental strength needed in today’s competitive society. With a very strong emphasis on precision and respect for the weapon, it is the ideal art for developing mental and physical sharpness as well as accuracy. Pakua Tai Chi, also known as Cosmo Dynamics, imitates the astral movements to form this compilation of slow and steady motions. It develops physical as well as mental balance, while working on a person’s harmony with himself and his surroundings. 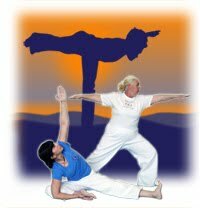 Increase in muscle tone, speed and inner calm are also attained through the practice of Cosmo Dynamics. than a class of Cosmo Dynamics. The practitioner advances at a his or her personal rhythm and the movements allow for any body limitation. Young or old, fit or restricted, the movements replenish the body and nourish the soul. himself as well as his surroundings. Pa-Kua develops every part of the human anatomy by generating a proper flow of energy within the body. The movements are studied to provide an internal massage of the organs as well as develop in the student an unparallel coordination of movements coupled with improved mind/body communication. The training on slow forms nurtures harmony and growth of the spiritual and physical life force. Pa-Kua is a complete art and gives its practitioner a better sense of self confidence, increases concentration, augments coordination and improves flexibility. It is an art practiced by people of all ages and its benefits are valued by all. 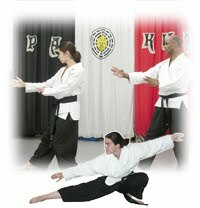 Martial Arts for kids, are available for children ages five and up at the Pakua Long Island School. Children greatly benefit from our program that is structured to fit their specific age groups. Age appropriate games and exercises introduce the young students to the discipline needed for Martial Art. This will in turn help them in school and later in life. This form of positive reinforcement of their strengths and encouraging attitude toward overcoming their weaknesses, helps expand their abilities. The lessons learned on the mat expand way beyond the walls of the dojo and last a lifetime. The martial arts games, the kicks and punches, as well as the interaction with other children experienced through Pakua Martial Arts, serve to increase the child's confidence, self-esteem, and social skills. At the same time Pa-Kua Martial Arts, teaches the child to respect peers and elders, works on the student's concentration and coordination, and provides the pupil with the tools needed for the full life that lays ahead. This occurs in the positive environment that characterises the Pakua School System. The many benefits of Pa-Kua Martial Arts for children are clearly visible and reflected in the child's school work, behavior at home, and interaction with siblings or friends. The classes for children are conducted in a totally safe and professional environment, by well trained Instructors and Masters.